World 3-1 is the first course of World 3 in Super Mario 3D Land. It is the first desert level in the game. The level takes place on a giant sand platform with a tall tower in the center. Sandmaarghs and Pokeys roam about here. There is also a P Switch that creates a very long trail of sixty-four notes, giving a Super Leaf or a 1-Up Mushroom, depending on the player's form. A tall platform with a Cannon can be used to reach the tower's door, which is guarded by a Thwomp, a Wallop, and a Blokkablok. 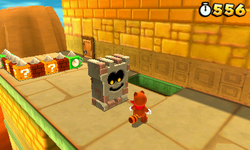 Mario can grab a Propeller Box, located next to two groups of three ascending coins near the first Star Medal, and use it to fly above a bunch of Blocks and a Fake Block before reaching a door on the right-hand side, allowing him to enter the tower. Inside the tower, there is a narrow path with two Thwomps, a Blokkablok, and more Pokeys in a quicksand pool. A Warp Box warps Mario to the next floor, which has the Checkpoint Flag and a door which leads Mario outside again, to a Red Ring and moving platforms that lead to the third floor. On this floor, Mario finds lines of Wallops. In the end, another Thwomp is found, along with a blue + Clock and a door. Mario can use this door to reach the tower's roof (which contains a little pool of water with three coins in it), where Mario reaches the Goal Pole. Star Medal 1: In the right side of the tower, Mario will find a Brick Block covering a hole in the tower's wall. He must break this with a somersault. Crossing the hole, there is a small room with the first Star Medal. Star Medal 2: Mario must enter the Cannon. Then, he must be launched to the right corner of the tower, where is a moving platform with the second Star Medal. Star Medal 3: Mario must go to the top of the last Thwomp, and then Wall Jump on the right wall to collect the third Star Medal.